Feeling spring, feeling a craving for good Sheffield-orientated food and cooking or feeling a need to be in a good place? then how about popping down to Sheffield’s Bradfield Farmers’ Market, 10am to 4pm, this Saturday – featuring over 20 different food stalls on offer you’ll definitely be spoilt for choice. Missie Cindz will be there giving a helping hand (but more than likely forking around) to the likes of @teaboxonline @OurCowMolly @SheffieldHoney @lornaheavenlies @justpreserves and lots more Sheffield others (and I’ll also try my best not to eat up all your food stuff by lunchtime too – just lock me up in the barn if I begin to scoff rather than sell). You might be thinking, “Is it just me, or does it seem like farmers’ markets are popping up everywhere nowadays?” – well, you could be right and surely that’s a good thing right? :) your Missie Cindz reckons so. I’ve been really busy fooding around these past few weeks, meeting more new food producers – putting lovely faces to those delicious tweets (my oh my how you all look so very different to your 24px by 24px pixel avatars) and I’m looking forward to meeting and seeing even more faces this weekend. All this food adventuring in Sheffield I’m experiencing is also proving too delicious to handle and aren’t doing any good to the Missie C’s summer diet (YES, I know, I didn’t think the term ‘diet’ could exist in my dictionary but since I’ve been scoffing my way through Sheffield, if those bright frocks are going to be part of Missie’s identity then I better do some compensating :) LOL… Oh well, at least I know I’m doing the ‘See Food!’ diet very well though. YAY for the season of hot cross buns too! I do love them spilt, toasted and buttered, but am also more than happy with scoffing whole, untoasted ones with smears of butter or slathered with Nutella. I’m pleased hot cross buns are available throughout the year – spiced, fruited breads are delicious. They’re great as a snack served with a hot drink, aren’t as sweet as a piece of cake yet not too plain like bread roll. Perfect! I really think the X bun should be more highly praised and talked about alot more. My Missie style is to cram as many as possible into my diet until they disappear from the shelves (or, at least, from the promotional hotspots and back into the muffin and bread aisle). How many could you scoff this weekend? (this week I’ve already had two!). Oh and on a final note, Missie’s been recruited by the @RutlandArms Look here: http://t.co/R8dCRoH Job titles includes: full-time Graphic Designer, daily Sheffield Food ‘Sampler’ and blogger/tweeter flying around on her smiley ‘Sheffield Steel’ fork and now, I’m also a P/T bartender at the good Ol’ Rutty too! – WOW, I’m the Cinders of all trades :) If you do happen to see me fooding around or passing by on my Sheffield Food Adventures, please stop and say hello or tweet a picture of your Missie, remembering to tag @missiecindz in your photo. 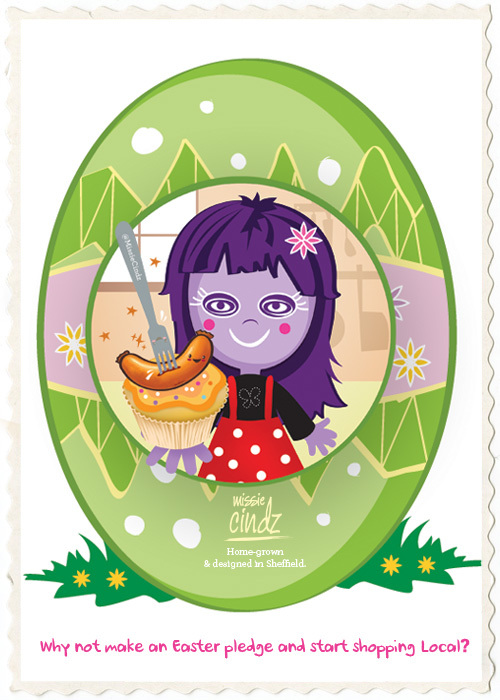 Happy Easter everyone – Let’s scoff ourselves on Sheffield!